For the Turkish town and district, see Taşkent. For the World War II Soviet destroyer, see Tashkent-class destroyer. 'Tashkend' redirects here. For other towns also sometimes romanized as Tashkend, see Daşkənd. 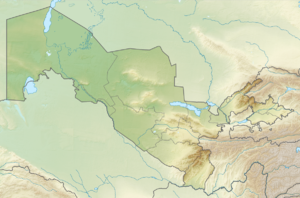 Tashkent (/ˌtæʃˈkɛnt/; Uzbek: Toshkent, Тошкент, تاشكېنت, [tɒʃˈkent]; Russian: Ташкент, [tɐʂˈkʲent]) is the capital and largest city of Uzbekistan, as well as the most populated city in ex-Soviet Central Asia (though the larger urban centers of Urumqi in China and Kabul in Afghanistan lie well within the geographic region of Central Asia) with a population in 2018 of 2,485,900. It is located in the north-east of the country close to the Kazakhstan border. Tashkent was influenced by the Sogdian and Turkic cultures in its early history, before Islam in the 8th century AD. After its destruction by Genghis Khan in 1219, the city was rebuilt and profited from the Silk Road. From 18th to 19th century, the city became an independent city-state, before being re-conquered by the Khanate of Kokand. In 1865, it fell to the Russian Empire, and became the capital of Russian Turkestan. In Soviet times, Tashkent witnessed major growth and demographic changes due to forced deportations from throughout the Soviet Union. Today, as the capital of an independent Uzbekistan, Tashkent retains a multi-ethnic population, with ethnic Uzbeks as the majority. In 2009, the city celebrated its 2,200 years of written history. Tashkent was settled by ancient people as an oasis on the Chirchik River, near the foothills of the West Tian Shan Mountains. In ancient times, this area contained Beitian, probably the summer "capital" of the Kangju confederacy. Some scholars believe that a "Stone Tower" mentioned by Ptolemy and by other early accounts of travel on the Silk Road referred to this settlement ("Tashkent" means "stone city"). This tower is said to have marked the midway point between Europe and China. Other scholars, however, disagree with this identification, though it remains one of four most probable sites for the Stone Tower. In pre-Islamic and early Islamic times, the town and the province were known as Chach. The Shahnameh of Ferdowsi also refers to the city as Chach. The principality of Chach had a square citadel built around the 5th to 3rd centuries BC, some 8 kilometres (5.0 mi) south of the Syr Darya River. By the 7th century AD, Chach had more than 30 towns and a network of over 50 canals, forming a trade center between the Sogdians and Turkic nomads. The Buddhist monk Xuanzang (602/603? – 664 AD), who travelled from China to India through Central Asia, mentioned the name of the city as Zhěshí (赭時. The Chinese chronicles Book of Sui from the History of Northern Dynasties and Old Book of Tang, mention a possession called Shí 石 or Zhěshí 赭時 with a capital of the same name since the fifth century AD. In the early 8th century, the region was conquered by Muslim Arabs. In the mid-seventh century, the Sasanian Persian Empire collapsed as a result of the Arab Muslim conquest of Persia. Under the Samanid dynasty (819–999), whose founder Saman Khuda was a Persian Zoroastrian convert to Islam, the city came to be known as Binkath. However, the Arabs retained the old name of Chach for the surrounding region, pronouncing it ash-Shash instead. Kand, qand, kent, kad, kath, kud—all meaning a city—are derived from the Persian/Sogdian کنده kanda, meaning a town or a city. They are found in city names such as Samarkand, Yarkand, Panjakent, Khujand etc.). After the 16th century, the name evolved from Chachkand/Chashkand to Tashkand. The modern spelling of "Tashkent" reflects Russian orthography and 20th-century Soviet influence. 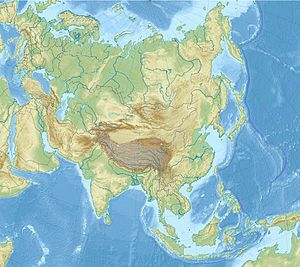 The city was destroyed by Genghis Khan in 1219 and lost much of its population as a result of the Mongols' destruction of the Khwarezmid Empire in 1220. Under the Timurid and subsequent Shaybanid dynasties, the city's population and culture gradually revived as a prominent strategic center of scholarship, commerce and trade along the Silk Road. In 1809, Tashkent was annexed to the Khanate of Kokand. At the time, Tashkent had a population of around 100,000 and was considered the richest city in Central Asia. It prospered greatly through trade with Russia but chafed under Kokand’s high taxes. The Tashkent clergy also favored the clergy of Bukhara over that of Kokand. However, before the Emir of Bukhara could capitalize on this discontent, the Russian army arrived. Alexander Nevsky Cathedral was built by the Russian Orthodox Church in Tashkent. In May 1865, Mikhail Grigorevich Chernyayev (Cherniaev), acting against the direct orders of the tsar and outnumbered at least 15-1, staged a daring night attack against a city with a wall 25 kilometres (16 mi) long with 11 gates and 30,000 defenders. While a small contingent staged a diversionary attack, the main force penetrated the walls, led by a Russian Orthodox priest armed only with a crucifix. Although the defense was stiff, the Russians captured the city after two days of heavy fighting and the loss of only 25 dead as opposed to several thousand of the defenders (including Alimqul, the ruler of the Kokand Khanate). Chernyayev dubbed the "Lion of Tashkent" by city elders, staged a "hearts-and-minds" campaign to win the population over. He abolished taxes for a year, rode unarmed through the streets and bazaars meeting common people, and appointed himself "Military Governor of Tashkent", recommending to Tsar Alexander II that the city is made an independent khanate under Russian protection. In April 1918, Tashkent became the capital of the Turkestan Autonomous Soviet Socialist Republic (Turkestan ASSR). The new regime was threatened by White forces, basmachi; revolts from within, and purges ordered from Moscow. In 1930, Tashkent fell within the borders of the Uzbek SSR, and became the capital of the Uzbek SSR, displacing Samarkand. Violating the Molotov–Ribbentrop Pact, Nazi Germany invaded the Soviet Union in June 1941. The government worked to relocate factories from western Russia and Ukraine to Tashkent to preserve the Soviet industrial capacity. This led to great increase in industry during World War II. On 10 January 1966, then Indian Prime Minister Lal Bahadur Shastri and Pakistan President Ayub Khan signed a pact in Tashkent with Soviet Premier Alexei Kosygin as the mediator to resolve the terms of peace after the Indo-Pakistani War of 1965. On the next day, Shastri died suddenly, reportedly due to a heart attack. It is widely speculated that Shastri was killed by poisoning the water he drank. On 26 April 1966, much of the old city was destroyed by an earthquake. More than 300,000 residents were left homeless. Some 78,000 poorly engineered homes were destroyed, mainly in the densely packed areas of the old city, where traditional adobe housing predominated. The Soviet republics, and some other countries such as Finland, sent "battalions of fraternal peoples" and urban planners to help rebuild devastated Tashkent. They created a model Soviet city of wide streets planted with shade trees, parks, immense plazas for parades, fountains, monuments, and acres of apartment blocks. 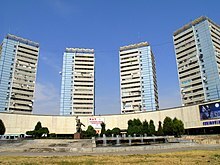 About 100,000 new homes were built by 1970, but the builders occupied many, rather than the homeless residents of Tashkent. 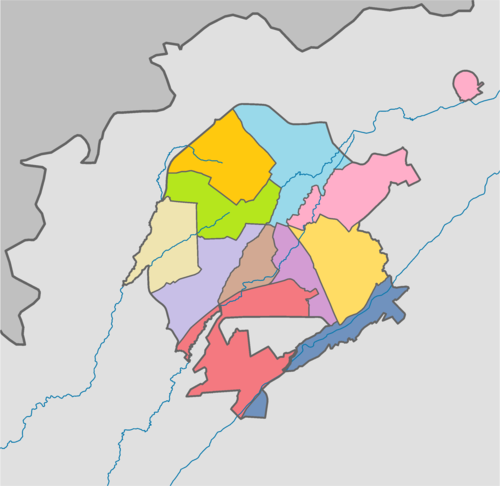 Further development in the following years increased the size of the city with major new developments in the Chilonzor area, north-east and south-east of the city. Due to the 1966 earthquake and the Soviet redevelopment, little architectural heritage has survived of Tashkent's ancient history. Few structures mark its significance as a trading point on the historic Silk Road. Tashkent is the capital of and the most cosmopolitan city in Uzbekistan. It was noted for its tree-lined streets, numerous fountains, and pleasant parks, at least until the tree-cutting campaigns initiated in 2009 by the local government. 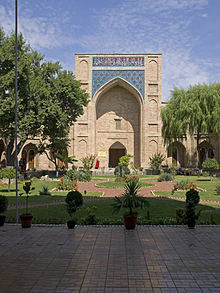 In 2007, Tashkent was named a "cultural capital of the Islamic world" by Moscow News, as the city has numerous historic mosques and significant Islamic sites, including the Islamic University. Tashkent holds the Samarkand Kufic Quran, one of the earliest written copies of the Quran, which has been located in the city since 1924. The first demonstration of a fully electronic TV set to the public and committee was made in Tashkent in summer 1928 by Boris Grabovsky and his team. In his method that had been patented in Saratov in 1925, Boris Grabovsky proposed a new principle of TV imaging based on the vertical and horizontal electron beam sweeping under high voltage. Nowadays this principle of the TV imaging is used practically in all modern cathode-ray tubes. Historian and ethnographer Boris Golender (Борис Голендер in Russian), in a video lecture, described this event. This date of demonstration of the fully electronic TV set is the earliest known so far. Despite this fact, most modern historians disputably consider Vladimir Zworykin and Philo Farnsworth as inventors of the first fully electronic TV set. In 1964, the contribution made to the development of early television by Grabovsky was officially acknowledged by the Uzbek government and he was awarded the prestigious degree "Honorable Inventor of the Uzbek Soviet Socialist Republic". Tashkent is situated in a well-watered plain on the road between Shymkent and Samarkand. Tashkent sits at the confluence of the Chirchiq River and several of its tributaries and is built on deep alluvial deposits up to 15 metres (49 ft). The city is located in an active tectonic area suffering large numbers of tremors and some earthquakes. The local time in Tashkent is UTC/GMT +5 hours. Tashkent features a Mediterranean climate (Köppen: Csa) with strong continental climate influences (Köppen: Dsa). As a result, Tashkent experiences cold and often snowy winters not typically associated with most Mediterranean climates and long, hot and dry summers. Winters are cold and often snowy, covering the months of December, January and February. Most precipitation occurs during these months which frequently falls as snow. The city experiences two peaks of precipitation in the early winter and spring. The slightly unusual precipitation pattern is partially due to its 500 m (roughly 1600 feet) altitude. Summers are long in Tashkent, usually lasting from May to September. Tashkent can be extremely hot during the months of July and August. The city also sees very little precipitation during the summer, particularly from June through September. Fine Arts Museum of Uzbekistan. It contains a major collection of art from the pre-Russian period, including Sogdian murals, Buddhist statues and Zoroastrian art, along with a more modern collection of 19th and 20th century applied art, such as suzani embroidered hangings. Of more interest is the large collection of paintings "borrowed" from the Hermitage by Grand Duke Romanov to decorate his palace in exile in Tashkent, and never returned. Behind the museum is a small park, containing the neglected graves of the Bolsheviks who died in the Russian Revolution of 1917 and to Osipov's treachery in 1919, along with first Uzbekistani President Yuldosh Akhunbabayev. State Museum of History of Uzbekistan the largest museum in the city. It is housed in the ex-Lenin Museum. 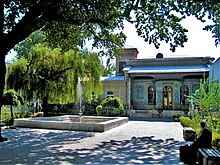 Navoi Literary Museum, commemorating Uzbekistan's adopted literary hero, Alisher Navoi, with replica manuscripts, Islamic calligraphy and 15th century miniature paintings. The Russian Orthodox church in Amir Temur Square, built in 1898, was demolished in 2009. The building had not been allowed to be used for religious purposes since the 1920s due to the anti-religious campaign conducted across the former Soviet Union by the Bolshevik (communist) government in Moscow. During the Soviet period the building was used for different non-religious purposes; after independence it was a bank. 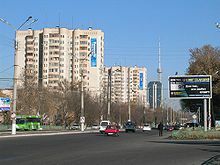 Moreover, there are digital broadcasting systems available in Tashkent which is unique in Central Asia. Tram transport end at 1 May 2016. There are several shopping malls in Tashkent which are good both for entertainment and shopping. These include Next, Samarqand Darvoza and Kontinent shopping malls. Next mall is very popular among families and prominent for its Science Lab for kids, Dinosaur’s museum, Ice Rink and Cinema. Samarqand Darvoza offers a wide range of entertaining including Playground for kids, Game area, bowling and convenient multilayer parking place. It is a good place for kids’ birthday parties and family entertainment. Kontinent Mall is conveniently located next to the Grand Mir Hotel. It is a smaller place but combines a variety of dining options such as diet cafe, fast food court and a bar. Maksim Shatskikh, a striker for the Uzbekistan national football team, is from Tashkent. Football is the most popular sport in Tashkent, with the most prominent football clubs being Pakhtakor Tashkent FK and FC Bunyodkor, both of which compete in the Uzbekistan Super League. Footballers Maksim Shatskikh, Peter Odemwingie and Vasilis Hatzipanagis were born in the city. Gymnasts Alina Kabaeva and Israeli Olympian Alexander Shatilov were also born in the city. Former world champion and Israeli Olympic bronze medalist sprint canoer in the K-1 500 m event Michael Kolganov was also born in Tashkent. ^ "Residents of Tashkent city exceeds 2.48m people". Uzdaily.com. ^ "Юбилей Ташкента. Такое бывает только раз в 2200 лет". Фергана - международное агентство новостей. Retrieved 10 December 2017. ^ Pulleyblank, Edwin G. "The Consonantal System of Old Chinese," Asia Major 9 (1963), p. 94. ^ Dean, Riaz (2015). "The Location of Ptolemy's Stone Tower: the Case for Sulaiman-Too in Osh". The Silk Road. 13: 76. ^ Planet, Lonely. 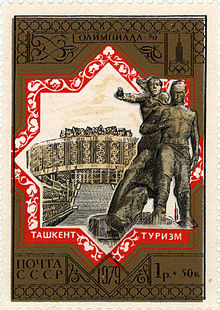 "History in Tashkent, Uzbekistan". ^ a b c d Sadikov, A C; Akramob Z. M.; Bazarbaev, A.; Mirzlaev T.M. ; Adilov S. R.; Baimukhamedov X. N.; et al. (1984). Geographical Atlas of Tashkent (Ташкент Географический Атлас) (in Russian) (2 ed.). Moscow. pp. 60, 64. ^ Nurtaev Bakhtiar (1998). "Damage for buildings of different type". Institute of Geology and Geophysics, Academy of Sciences of Uzbekistan. Retrieved 7 November 2008. ^ "Good bye the Tashkent Public Garden!". Ferghana.Ru. 23 November 2009. Retrieved 30 September 2012. ^ "Moscow News – World – Tashkent Touts Islamic University". Mnweekly.ru. 21 June 2007. Archived from the original on 15 April 2008. Retrieved 6 May 2009. ^ "Tashkent's hidden Islamic relic". BBC. 5 January 2006. Retrieved 16 April 2011. ^ "Видеолекторий «Ферганы»: Изобретение телевидения и Борис Грабовский". Фергана.Ру. ^ "Invention of the Iconoscope, the First Electronic Television Camera : HistoryofInformation.com". www.historyofinformation.com. ^ a b "World Weather Information Service – Tashkent". World Meteorological Organisation. Retrieved 16 August 2012. ^ Tashkent Travel. "Tashkent weather forecast". Tashkent, Uzbekistan. Archived from the original on 29 May 2009. Retrieved 11 June 2009. ^ Happy-Tellus.com. "Tashkent, Uzbekistan travel information". Helsinki, Finland: Infocenter International Ltd. Archived from the original on 27 June 2009. Retrieved 11 June 2009. ^ "Climate Data for Tashkent". Centre of Hydrometeorological Service. Retrieved 28 November 2012. ^ "Weather and Climate-The Climate of Tashkent" (in Russian). Weather and Climate. Retrieved 16 August 2012. ^ "Tashkent Climate Normals 1961–1990". National Oceanic and Atmospheric Administration. Retrieved 12 February 2017. ^ "ТАШКЕНТ (город)". Dic.academic.ru. Retrieved 24 November 2013. ^ MacWilliams, Ian (5 January 2006). "Tashkent's hidden Islamic relic". BBC News. Retrieved 8 June 2010. ^ Smele, Jonathan D. (20 November 2015). Historical Dictionary of the Russian Civil Wars, 1916–1926. Rowman & Littlefield. p. 58. ISBN 978-1442252806. Retrieved 16 May 2016. ^ "Sports-reference.com". Sports-reference.com. 24 October 1974. Retrieved 24 November 2013. ^ "International Cooperation: Sister Cities". Seoul Metropolitan Government. Archived from the original on 10 December 2007. Retrieved 26 January 2008. Wikimedia Commons has media related to Tashkent.